Les Carpenter passed away July 3, 2018. He was most recently CEO of the Native Communications Society of the Northwest Territories, including CKLB radio. Earlier, he was with CBC radio in Univuk; he was also the first Mayor of Sachs Harbour (at age 16), the first chair of the Inuvialuit Regional Corporation, the Chief Negotiator to establish two Canadian Parks, and a member of the United Nations Special Task Force on Aboriginal Peoples. Read and hear more at the memorial post on CKLB’s website. 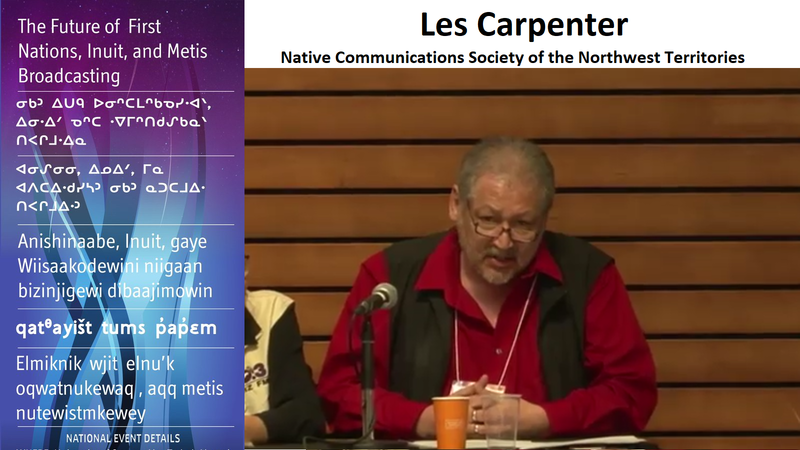 This presentation is from June 2017, at The Future of First Nations, Inuit, and Métis Broadcasting gathering in Ottawa. By Miranda Brady and John Kelly; UBC Press, published fall 2017 with paperback version June 2018. We Interrupt This Program is a hopeful title for a timely book. Focusing on the past 10 years, authors Miranda Brady and John Kelly examine how Indigenous media-makers of various forms are disrupting the neocolonial Canadian media terrain to assert Indigenous priorities, cultures, and aesthetics. Both authors are professors at Carleton University; Brady is a settler who studies Indigenous identities and media; Kelly is Haida from Skidegate, and worked in journalism prior to academia. Most of the chapters centre around case studies. The first two cases, of the Truth and Reconciliation Commission (TRC) and IsumaTV, discuss residential school testimonies, methods of documentation, and archives. The authors contrast the short “wrongdoing-focused” public testimonies of the TRC with IsumaTV’s hour-plus online recordings of Inuit residential school survivors. In the latter, testifiers were encouraged to discuss in depth the impacts of the schools on collective life. In contrast, the TRC testimonies had strict time limits – causing one commissioner to remark, “We’re starting to pick up the habits of our white brothers.” The IsumaTV testimonies were an external method for Inuit people to assert their needs within the framework of the TRC, and helped get an Inuit sub-commission in the TRC. These chapters also discuss the uncertain futures of the archives, in part due to challenges with funding. The third chapter highlights three Indigenous artists who are challenging non-Native representations of Indigenous peoples: Dana Claxton, Jackson 2bears, and Kent Monkman. Their work acts to remediate existing media norms and historical art, exposing the mechanics behind settlers’ stereotypical representations of Indigenous peoples. The fourth chapter focuses on the imagineNATIVE Film & Media Arts Festival in Toronto and filmmakers Jeff Barnaby, Terril Calder, and Shane Belcourt. The festival’s success is attributed to its ability to build community and supportive, inclusive networks, and to provide essential exposure for diverse media-makers. The festival helps Indigenous filmmakers confront their main barriers within the film industry: financing, cultural misconceptions, access to industry partners and networks, and distribution. The book doesn’t explore social media, though it was conceived and grew rapidly in the decade this book covers. Without it, the book has less sense of the real-time implications of Indigenous media-making, including its role in facilitating social movements like Idle No More and #NoDAPL. As the authors note, Indigenous peoples’ relationships to media have evolved as “colonization happened synchronously with the development of a number of media technologies, including photography and motion pictures.” The recent and dramatic collective shift in our relationships to media has occurred alongside a significant shift in Indigenous relations with settler society – during an age of so-called “reconciliation” and increased visibility of Indigenous perspectives, including dissent. The book provides an analytical perspective to help readers reflect on what types of new interruptions may be brewing – or to plan the interventions themselves.